Golden Japanese Forest Grass is an amazing ornamental that thrives in part shade to shady areas. 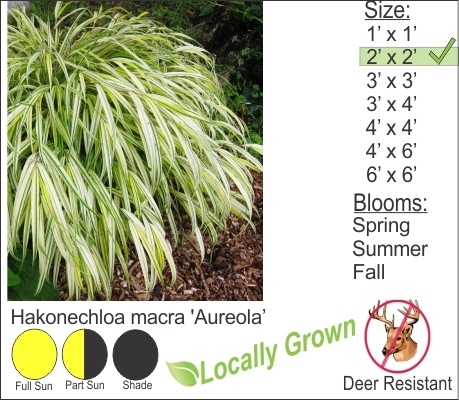 Yellow to creamy foliage resembles small clumping bamboo and this hardy perennial grass is deer resistant. Combine several to create a clumping ground cover or just use this grass as a single specimen and plant it with May Night Sage. You can also plant Hakinechola macra (a fun name to say) in container plantings and combine it with the burgundy foliage of begonias or purple smoke bush.